What makes the letter so interesting is that the previous Nov. 15 Denton had written to Fowler criticizing him and Robert Alexander for land speculation. John Bunyan Denton was born in Tennessee in 1806. He was orphaned at age 8 and eventually moved to Arkansas. He was converted and became a Methodist preacher. When Fowler travelled through Arkansas in 1837 on his way to the Texian Mission, he invited Denton to come with him. Denton, although never formally commissioned as a missionary connected with the Mississippi Conference, provided useful service to the cause of Methodism in northeastern Texas. The practice of law in the Republic of Texas was often an adjunct to land speculation. The Spanish, Mexican, and Republic of Texas governments all made very generous land grants to encourage immigration and reward meritorious service. The result was a hodgepodge of conflicting surveys, grants, land warrants, and contested titles, all of which provided great opportunity for lawyers to sort through the conflicts. From 1838 to 1841 Denton practiced law in Clarksville, engaged in land speculation, and continued to fill Methodist pulpits. In May 1841 he was killed at the Battle of Village Creek about at the Dallas/Tarrant County line. In 1846 the Legislature created a new county in the region and named it after Denton. Much later his remains were moved to the courthouse grounds. Of the 254 counties in Texas, Denton is the only one I have found to be named for a Methodist preacher. If readers know of another, please post it as a reply. The third session of the Texas Annual Conference was held in Bastrop in December 1842. Bishop Robert Roberts was supposed to preside, but he did not arrive so the conference elected Robert Alexander as their presiding officer. The conference then found that Bishop Roberts had presided over the Arkansas Annual Conference in Helena, but became ill and returned to his Indiana home rather than travelling on to Bastrop. Bishop Roberts did have a serious illness. He died of “bilious fever” on March 26, 1843, in Lawrence County, Indiana. Roberts (b. 1778) and Enoch George had been elected to the episcopacy by the General Conference of 1816. 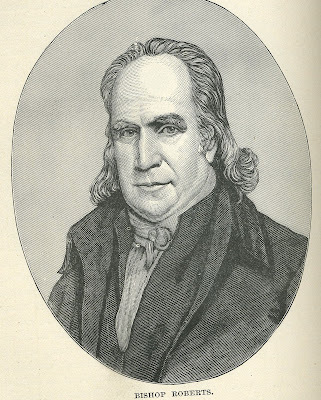 Francis Asbury had died in March, 1816, leaving Bishop William McKendree with too much work and too many miles to travel. The opening of the Ohio Valley to settlement following the War of 1812 resulted in a flood of Methodist activity in the West. New conferences were being established at every quadrennial General Conference, and more bishops were needed. Roberts was the first Methodist Episcopal Church bishop who was married. The meager salary that went with the office of bishop was not enough for a family. Roberts supported himself by farming. From his election in 1816 to his last episcopal tour in the winter of 1842 he travelled thousands of miles presiding over annual conferences. He died at his farm house. He was buried near that location, but his remains were later removed to DePauw University where he also has a building named in his honor. In a side note--David Ayres had taken his buggy from Centre Hill to Houston in anticipation of Bishop Robert's arrival. Ayres intended to transport Roberts in the comfort of that buggy to conference at Bastrop. When Roberts did not show up in Houston, that left an empty seat. Homer Thrall, newly arrived from Ohio, was thus the beneficiary of a buggy ride from Houston to Bastrop. The General Conference of 1866 of the MECS authorized the creation of new conferences in Texas. The northern portion of the East Texas Conference was broken off and named the Trinity Conference. Four years later it was renamed the North Texas Conference. The northern portion of the Texas Conference was broken off and formed the North West Texas Conference. In 1910 that conference was divided to produce the conference boundaries that exist today. The North West Texas Conference soon began establishing colleges. Waco Female Seminary and Marvin College sprang up. Unfortunately both were encumbered by crushing debts and had to close. Most Methodist colleges of the 19th century began with optimistic prospects, but none more so than Marvin College in Waxahachie. It quickly opened a preparatory department and hired J. W. P. McKenzie, the most prominent Texas Methodist educator of the era, as the college's first president. The venerable McKenzie, already over sixty years old, moved from Itinerant’s Retreat near Clarksville and assumed the presidency. Unfortunately McKenzie gave his personal guarantee for some of the debts of the school. A creditor sued him and obtained a $1000 judgment. Other disputes with trustees over debt and declining health made Itinerant’s Retreat look better all the time. He left after one year as president. The trustees turned to a Mississippi minister named Josiah Pugh as the new president. There were some successes. Marvin College received its incorporation from the state in 1873 and boasted a three story classroom building and two dormitories. In addition to the usual classical curriculum, students could take courses in military science, telegraphy, geology, and waxworks. When the conferences united on a central university in Georgetown rather than Waxahachie, Marvin College had too much competition. Trustees continued to borrow and pledge the college property as collateral. The 12% interest rate was just too heavy a burden. The mortgage holders foreclosed on March 15, 1879. The college operated without a formal Methodist connection for a few more years, but the buildings were finally taken over by the Waxahachie public schools. The Executive Committee of the Texas United Methodist Historical Society has announced that the annual meeting will be held at Kessler Park United Methodist Church, 1215 Turner Ave., Dallas, Texas. Registration will begin at noon on Friday, March 27. The afternoon program will consist of historical papers concerning the careers of two founding presidents of Texas Methodist universities, J. W. Hunt and Robert S. Hyer, who founded McMurry University and SMU respoectively. The keynote speaker at the Friday evening banquet will be Dr. Ted Campbell of Perkins School of Theology. Saturday morning will feature Bishop John Wesley Hardt speaking on the subject of how revivals influenced decisions for church vocation. Saturday morning will also feature the business meeting of the TUMHS and the announcement of the 2009 Kate Warnick Awards for best published local church histories. A registration fee of $25 (which includes dinner) may be sent to the Rev. John C. Johnson at 6766 Silver Saddle Rd., Fort Worth, Tx 76126. Make checks payable to TUMHS. On March 10, 1838 Marin Ruter found himself at Egypt on the Colorado. He found time to write to Rev. William H. Raper who had been one of his colleagues when he had served in Cincinnati. . . .We have already formed twenty societies in Texas, have obtained a number of lots for churches and school houses, secured by deeds, and several meeting houses are commenced with a prospect of soon being completed. I trust, by the grace of God, to raise a glorious superstructure, and that the church of Christ will be here established in its purity, power, and glory. . .
William H. Raper, the recipient of the letter, is one of those remarkable 19th century Methodist circuit riders whose life was full of adventure, romance, and hardship. He was born in a blockhouse in western Pennsylvania in 1793. Little is known about his childhood, but he entered the pages of history during the War of 1812. Raper enlisted and, even though a youth, was elected sergeant. His company was sent to secure a strategic position and so he missed the Battle of Thames. Because his company had not been in the battle, it was at full complement, and was thus ordered to transport about 400 prisoners from Lake Erie across Ohio to Kentucky. Misadventures, disability of superior officers, and becoming lost in the Black Swamp found the 19–year old Raper in command a twelve man squad with 100 prisoners. Three days of being lost in the swamp without food resulted in a mutiny of the prisoners. Bloodshed was averted when one of the prisoners took Raper’s side and talked the mutineers out of violence. In 1819 Raper joined the ranks of Methodist itinerants at Cincinnati, and just like the 19th century novels that depend upon coincidence------the former prisoner who had quelled the mutiny showed up at one of Raper’s camp meetings. Raper died in Aurora, Indiana, in 1852.